1 package (1 oz) dried mushrooms: porcinis, morels, oysters, chanterelles, etc. Place dried mushrooms in small bowl; cover with 1 ½ cups boiling water. Place a small plate on top of bowl and let mushrooms soak for 20 minutes. Remove mushrooms from bowl with slotted spoon and dry well with paper towel. Reserve ½ cup soaking liquid. Chop mushrooms and set aside. Loosen skin on chicken breast halves with fingertips and place whole tarragon leaves under skin, flattening and smoothing skin back into place. Sprinkle salt and pepper over chicken. Dredge chicken in flour and pat off excess. In large nonstick skillet over medium-high heat, warm canola oil. When very hot, add chicken breast halves, skin-side down and cook 4-6 minutes or until skin is nicely browned. Transfer chicken to shallow baking dish, skin-side up. Add butter to same skillet; melt over medium heat. Add shallot, mushrooms and chopped tarragon; sauté 2 minutes, then remove mixture from pan and spoon over chicken. Pour Golden Ale Beer into same skillet; stir in reserved ½ cup mushroom soaking liquid. Bring mixture to a boil; boil over high heat until reduced by half, about 6 minutes. Whisk in cream until blended; bring to a boil and simmer until lightly thickened. Pour mixture around chicken. Place in oven and bake 35 – 40 minutes, or until chicken is cooked through. 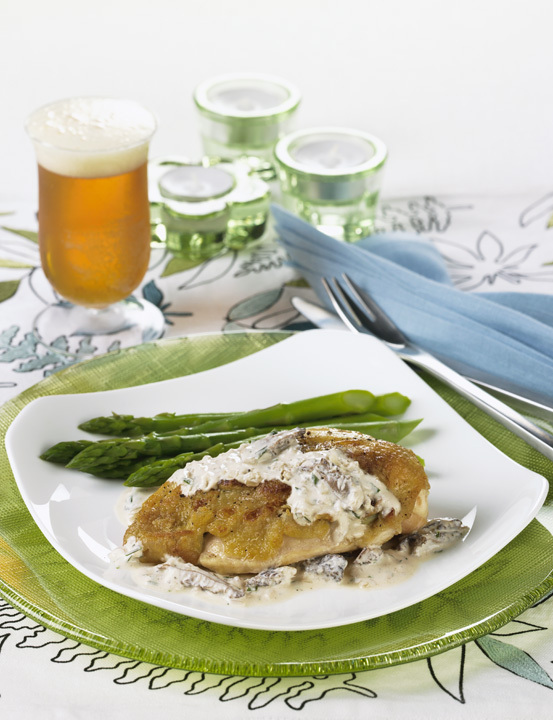 Transfer chicken to plates or serving platter and serve with mushroom sauce. *This information provided by National Beer Wholesalers Association, www.nbwa.org.